Here's what I've been working on this week! While I was on vacation, I saw an awesome toucan sculpture made from different stones in one of the gem galleries. It was an instant WANT, but I thought, hey, why don't I make my own? It won't be made of rock, but it will be cute! So I started on this toco toucan guy on Monday. I had a little bit of air-dry clay in my stash, but I didn't want to use up ALL of it, not to mention wait days for such a huge hunk of clay to dry, so I first made the form of the toucan out of aluminum foil. The beak and body were made in two separate pieces, so the beak is attached and supported by two toothpicks jabbed in and glued at the base. I stabbed in and glued the legs, which were just made from pretty sturdy .032 safety wire. Then I just had to cover the outside as smoothly as I could with the air-dry clay. I wanted a reasonably thick layer, because I was planning on sanding it smoother once it dried. And I did. The clay sands really nicely when dry, actually! The clay I used is Premier Lightweight Stone Clay . Then all I had to do was paint the toco toucan goodness on with artist acrylics. I used those because they dry a little shinier than craft acrylics, and I wanted the sheen. Oh, and I also added the tail which is just a tail shape cut from thick canvas I had painted/stiffened with the same acrylics I used on the body. The mini-hat is from Hobby Lobby and embellished with a fancy pheasant feather and lots of novelty yarn! And I also decorated the base with a bunch of inchies made from a cut out book page and toucan doodles. I can't wait to show it to Bobby when he gets home! He's been watching this little sculpture progress over the past couple days... Anyhoo, happy Wednesday, friends! Until next time. 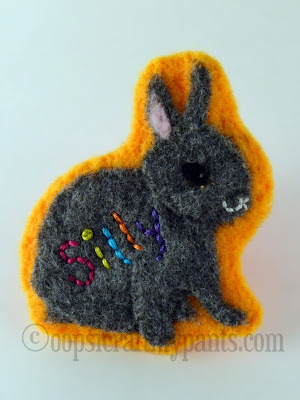 Another felt badge! I mostly used needle felting to make this little rabbit badge. I did four different layers of felt on the bunny (back legs, body, front legs, head) to try to get some dimension to it. It's a little hard to see, but easier to feel. Then I embroidered a little colorful silly on his rump for good measure. It's about 2.5x2.5''. Hey everybody! I just listed the first 5 bookmarks in my new Wicked Awesome Bookmark Series. It's going to be a limited series, with 100 unique witches... Why the new awesome ones? I've really been wanting to change up my bookmarks, as I've been making the same thing on a regular basis for over a year now. I need to keep things spicy to keep from going nuts! I also have been having a bit of a hard time, finding the bright side of living out here in Alabama, away from family and old friends... How do the two relate? So without further ado, here are the first 5 Wicked Awesome Bookmarks! So, please, help me reach my goal of having a toucan. If I can't have a baby, I want a toucan, dangit. Share these listings with your friends if you would like, and don't forget to check out my For Sale Page, always linked at the top of my blog. Thanks, friends! I know I've been too quiet on the blogging front... I know, I know, you've all been refreshing this page like 50 times per day to see something new ;) Kidding, of course. I can, however, tell you that I've been hard at work getting ready to release an exciting new wicked witch bookmark series. This pic is a sneak preview. Each bookmark will be unique, and will of COURSE feature those classic Wicked Witch of the East Legs with Ruby Slippers (Or Emerald! Or Sapphire! Oh, I've said too much!) They shall be hitting my Etsy Shop soon! That's all for now. I hope you all are having a wicked awesome week! I made a couple of cards for the young women at church to sign for a mother and daughter that are moving away to Oregon this week. I'm gonna miss them! I am just a teensy bit jealous they are moving back to the Pacific Northwest (home!) and I did a fair bit of sulking this weekend. Oh, Alabama, there is nothing wrong with you, but you're not my favorite. Oh well, life is good anyway. Happy Monday to you all. It's that time again, the beginning of a new month, and that means another calendar page! I wanted to go with something lively and cheerful, so I picked yellow this month. The page looks much better in person. I couldn't get the colors in my photo right, but you get the general idea. I used Wolfie King on this spread because he looks magnificent and powerful :) Can you tell that I'd like an energetic month? I started doing Zumba, and it's my third week! I feel GOOD. All I want to do is shake it! And here's a shot of the past four months of calendar spreads because it's colorful. If you haven't already, click to The Kathryn Wheel. That's where all this fun calendar business began!